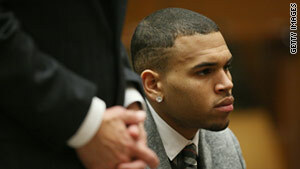 The "stay away" order imposed on Chris Brown two years ago was lifted by a Los Angeles judge on Tuesday. Los Angeles (CNN) -- Chris Brown doesn't have to worry anymore that bumping into ex-girlfriend Rihanna could get him locked up, but he still has to be careful about what he says to her. Los Angeles County Judge Patricia Schnegg lifted the "stay away" order imposed on Brown two years ago after he was charged with assaulting the singer on the eve of the 2009 Grammys. "He just can't bother her," lawyer Donald Etra, who represents Rihanna, said after Tuesday's hearing. A protective order banning Brown from harassing, stalking or striking Rihanna stays in place, the judge said. There are no restrictions on Brown calling or otherwise communicating with her, Etra said. Brown, 21, sat silently next to defense lawyer Mark Geragos in court during Tuesday's hearing. Brown was sentenced in August 2009 to serve five years probation and to spend more than 1,400 hours in "labor-oriented service" for the assault conviction. He was also ordered to complete a 52-week domestic violence program. Brown "has done a very good job of completing the domestic violence program in a timely manner," Schnegg said Tuesday. She said she would review Brown's progress on his community service requirement, which he is doing in his hometown of Richmond, Virginia, at a June 22 hearing. The restraining order previously required Brown to stay 50 yards away from Rihanna, 10 yards if the two are at the same industry event. It was set to expire in 2014, but Brown's lawyer asked the judge to lift it early. Schnegg delayed approving the request at the last hearing until she could hear from Rihanna's lawyer. "I have spoken to my client, and she does not object to the reduction to the stay away order," Etra told the judge Tuesday. Brown was arrested after an early morning argument inside a rented Lamborghini on a Hollywood street on February 8, 2009. According to Brown's probation report, the argument began over an incident at a Beverly Hills party. An earlier, sworn statement by Los Angeles Police Detective DeShon Andrews said the incident began when Rihanna found a text message on his cell phone from "a woman who Brown had a previous sexual relationship with." The pair argued while in the car driven by Brown, the police statement said. It went on to describe the assault in great detail, saying Brown punched Rihanna -- identified in the statement by her real first name, Robyn, and the first initial of her last name, Fenty -- numerous times and put her in a headlock, restricting her breathing and causing her to start to lose consciousness. He threatened to beat her and kill her, according to the statement, and he bit her ear and her fingers. Brown made a public apology in July 2009, in a video statement posted on his personal Web site. "I have told Rihanna countless times, and I'm telling you today, that I'm truly, truly sorry in that I wasn't able to handle the situation both differently and better," Brown said in the Web site statement.